Injured defencemen Jake Gardiner and Travis Dermott took another step forward in their recovery. Both injured blueliners went through skating drills together before the club's practice on Friday morning. Jake Gardiner has emerged ahead of #Leafs practice, and is heading off to skate with Travis Dermott. First time at least that I have seen him skating since #Leafs announced he was out with a back injury on Feb. 27. Dermott said he'll probably miss a couple more games while getting back up to speed for #Leafs, and hopes Jake Gardiner isn't far behind him: "He’s moving really well. I’ve seen him progress exponentially. I’m excited to hopefully have him back not much longer after I come back." "First time at least that I have seen him skating since the Leafs announced he was out with a back injury on Feb. 27," tweeted TSN's Kristen Shilton. "He's moving really well. I've seen him progress exponentially. 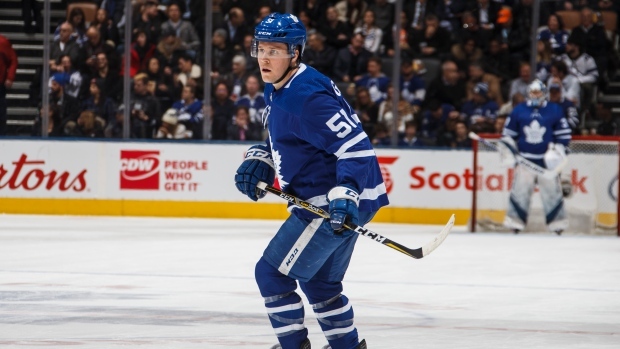 I'm excited to hopefully have him back not much longer after I come back," Dermott said of Gardiner. Gardiner was originally listed as being out week-to-week. The 28-year-old has two goals and is a plus-17 in 60 games this year. Dermott, who is battling a shoulder injury, has been skating on his own for over a week. He last played in an NHL game on Feb. 27 where he was a plus-1 in 17:05 of ice time. He said Friday that he will probably miss a couple more games while getting back up to speed. He has four goals and 13 assists in 60 games so far this season. The Leafs will be back in action Saturday night as they host the New York Rangers.